The assembly line approach: implementing proprietary tools for every stage in the process of preparing, modeling, querying and visualizing data. The Single-Stack™ approach: using a single tool that provides a complete solution for data preparation, analysis and visualization, but does so without forcing the organization to rely on massive deployments, troves of specialized personnel, or maintaining multiple separate components, modules or tools (you can read more about how this is achieved here). 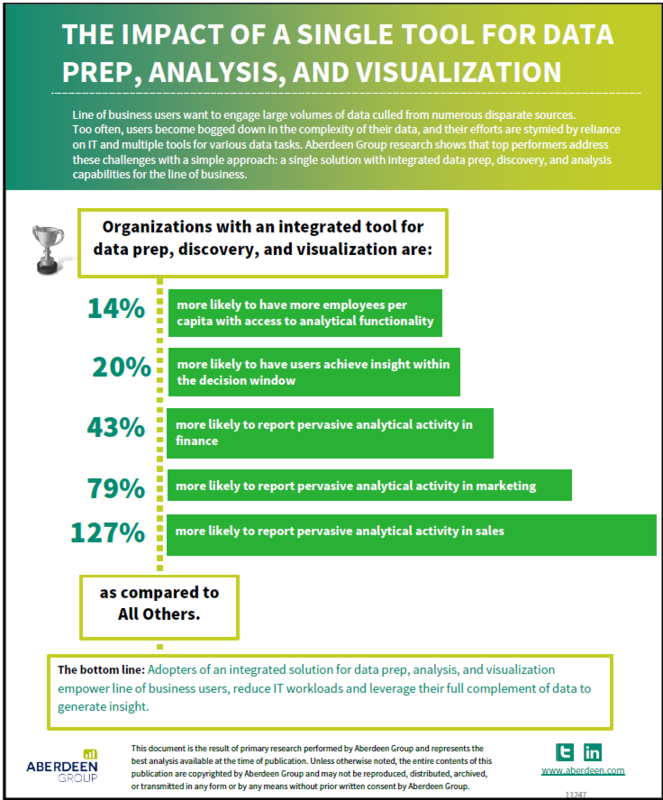 According to research by the Aberdeen Group, the impact of using a single tool for the entire scope of data preparation and analysis can be significant. Their findings are summarized in the infographic below. To learn more, you can watch the on-demand webinar: Simple Analytics: The Path from Complex Data to Insight, presented by the Aberdeen Group and Sisense.